The Trust is continuing with our mission to improve connectivity for fish passage along the length of the Hogsmill River which flows from Ewell to Kingston. 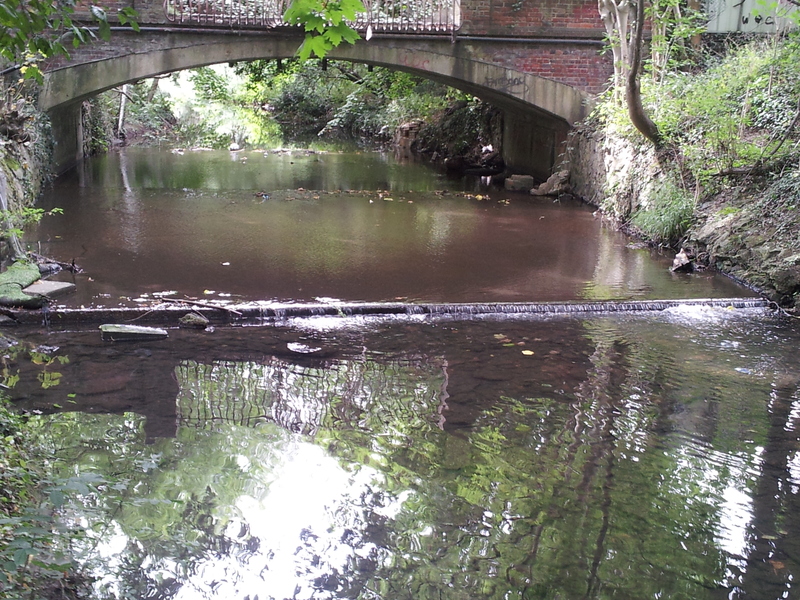 As a brief recap to the project, the Wandle Trust has received funding from Defra, through the Catchment Restoration Fund, to improve connectivity along the Hogsmill River. This is because fish passage has been identified as being a major contributing factor to the river’s current failing status under the European Union’s Water Framework Directive (WFD). At the start of the project there were 15 obstructions along the 6 mile length of the Hogsmill, resulting in the available habitat, of which much is heavily degraded, being highly fragmented and therefore limiting. This causes bottlenecks at varying life stages, ultimately leading to the survival of the fish species present being compromised and extremely vulnerable. Following on from the recently completed project in the Hogsmill Local Nature Reserve in the headwaters of the river, where two weirs were removed and the channel renaturalised, we have now moved our focus for the time being to the middle section of the river where two obstructions lie near to the Toby Carvery pub off the Old Malden Lane/Worcester Park Road. The problem here is twofold. Firstly, as the river flows under a bridge, the concrete footing which is 18m long and 9m wide causes the water to flow incredibly shallow. At the downstream end of this there is a lip with a head drop of approximately 200mm. The combination of these factors forms an obstruction, especially during low to moderate flow conditions. 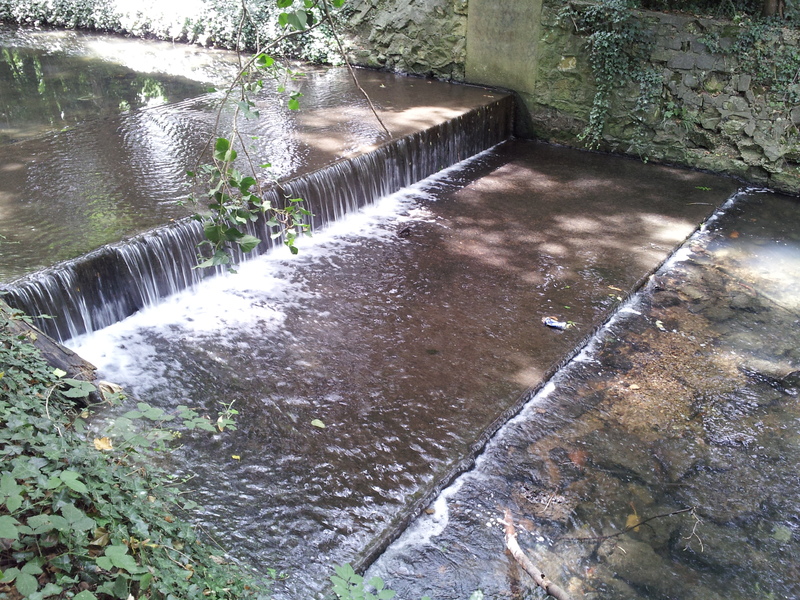 The second issue is that 60m further downstream there is a weir very similar to those that we recently removed. 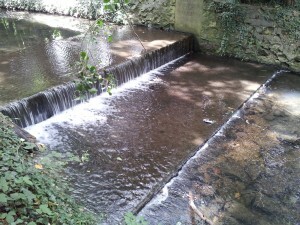 The weir is 7.5m wide with a concrete apron and sill with a head drop of 0.7m. This is a complete barrier at all times. The river through this stretch has historically been excessively dredged and as a result is over-wide, deep and with all of the gravels having been removed leaving a barren, lifeless clay bed. The project will also address these habitat issues. 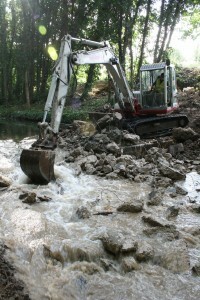 The solution that we have come up with, with design advice from Cain Bio-Engineering http://www.cainbioengineering.co.uk/, is to once again completely remove the downstream weir, including the abutment walls. This alone would not rectify the problem. Firstly, the bridge footing would still be impassable but secondly the fall from the bridge footing to the downstream bed level is too large. If left to its own devices, erosion would cause the footing to become undercut and a series of large, impassable cascades being formed. To remedy this, a series of 8-9 rock ramps will be installed to stabilise the bed and drop the river in 100-120mm increments. This will be achieved by driving in untreated chestnut posts to form a curve from one bank to the other. Narrow gaps will be left between each post and large gravel rejects will be placed upstream of these to essentially create a mini step. 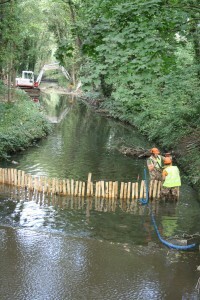 The posts will be driven deeper to create a discharge point which will be approximately one metre wide. The positioning of the discharge point will vary from one rock ramp to another to help create a sinuous channel through the reach. The positioning of which will be governed by the current topography which will become uncovered as the downstream weir is removed. The top ramp will be positioned to drown out the bridge footing by approximately 150-200mm to allow fish to pass. Creating a low flow channel will help to build the river’s resilience to potential climate change. Once the rock ramps are in, gravels will be introduced to narrow the over-wide channel, also creating a low flow channel between each rock ramp. The gravels will additionally provide vital habitat for varying levels through the food chain from plankton to invertebrates to fish. The Trust has brought in the help of Aquamaintain (http://aquamaintain.com/), a local contracting firm who specialise in all things fishy and watery. The company is run and site managed by Ben Kavanagh, with Northern John, Nick Gibson and Keith making up the team. One week into the project, things are going very well. The preliminary tree clearance to gain access has been undertaken, a track way has been cut into the bund along the length of the site to transport materials back and forth, and as I left site this morning, the fun bit, the first half of the weir was being broken out. 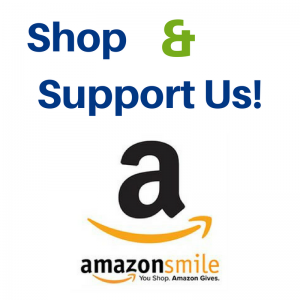 A big thanks also needs to go to Chris of Woodland Environmental who has kindly agreed to grant us access to get to the river through his land. Further updates to follow shortly. 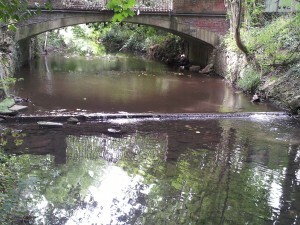 This entry was posted in Uncategorized and tagged Hogsmill, River restoration on October 1, 2013 by Toby.